Prominent & Leading Manufacturer from Jodhpur, we offer glass bead shot peening machine, 7 axis robotic shot peening machine, cnc ceramic bead shot peening machine, 8 axis robotic shot peening machine and shot peening machine. MEC CNC bead peening machine is designed for effective peening on aero engine component (Blade Airfoils). To generate the controlled compressive stress to the surface and to enhance the surface properties, increase fatigue strength by creating small pores, increase life of components and prevent galling, ferreting, cracking & corrosion.The system has capacity to peen upto 48" length of blade. To carve a niche in the market; our firm is actively engaged in offering 7 Axis Robotic Shot Peening Machine to our valuable clients. This machine can perform the peening job up to maximum size of 1500mm. 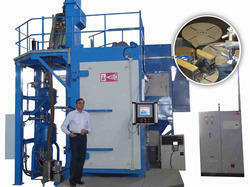 The offered machine is designed with utmost precision and accuracy to meet all the standards laid down by the industry. It is available in various specifications and can be further customized according to the needs of the clients. Moreover, customers can avail this at rock bottom price. MEC 7-axis Robotic Shot peening machine is designed to peen bucket root & profile blade for steam turbine. To generate the controlled compressive stress to the surface and to enhance the surface properties, increase fatigue strength, enhance lubricity by creating small pores, increase life of components and prevent galling, ferreting, cracking & corrosion. Machine is suitable for peening job of maximum size upto 1500mm. Turntable drive synchronized as 7th axis of robot. Spiral type separator for shape classification. 2nd door with turntable as 8th axis. 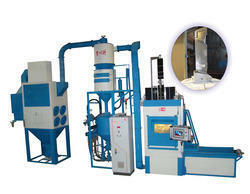 Being a leading name in the industry, we are providing an exclusive range of Cnc Ceramic Bead Shot Peening Machine. This machine is engineered with utmost care to peen 3 – 5 bucket profile blade for the gas turbine simultaneously. The offered product is made by using fine grade components at our technologically equipped manufacturing unit under the supervision of experts. Our team of adroit professionals stringently check this machine on several parameters to ensure its durability and high-efficiency. Moreover, customers can avail this at cost effective rates. MEC 2-axis CNC ceramic peening machine is designed to peen simultaneously 3 – 5 bucket profile blade for gas turbine. To generate the controlled compressive stress to the surface and to enhance the surface properties, increase fatigue strength, enhance lubricity by creating small pores, increase life of components and prevent galling, ferreting, cracking & corrosion. machine is suitable for peening job of maximum size 1000mm [L] x 500mm [w]. 2nd boor with turntable as 8th axis. Since the inception of our company, we are engaged in the providing best quality 8 Axis Robotic Shot Peening Machine. This machine is provided with high volume pressure chamber which allows peening for a longer duration. The product is designed at our hi-tech production unit by utilizing the superior quality components and advanced techniques in sync with industrial quality norms. The offered range is accurate in dimension and easy to install which is designed keeping in mind the universal quality standard. MEC's 8-axis Robotic Shot/SCCW peening machine is designed to peen bucket root for gas turbine. To generate the controlled compressive stress to the surface and to enhance the surface properties, increase fatigue strength, enhance lubricity by creating small pores, increase life of components and prevent galling, ferreting, cracking & corrosion. 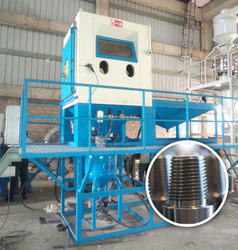 Machine is suitable for peening job of maximum size 1000mm [L] & 500mm [W]. Servo indexing table with 2 turntable positioning..
Other media like, nickel granules, SCCW, etc can be used. MEC automatic glass bead Shot Peening Machine is designed to peen API threads of drilling components as per MIL-S-13165 standard. To provide two axes shot peening operation for the generation of controlled compressive stress and to improve the galling resistance of the internal & external threads roots on the pipes at both ends. 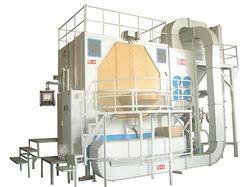 Machine is suitable for peening job of maximum size 12 mtrs [L] &12" Dia. 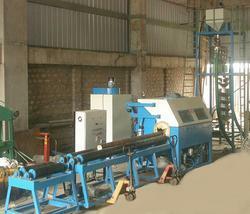 We are amongst the recognized names in the industry instrumental in providing Glass Bead Shot Peening Machine. 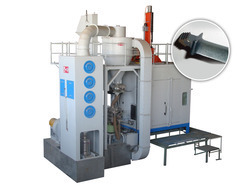 The offered peening machine provides controlled blasting process, which increases the fatigue life of various auto material subjected. The product is made at our technologically equipped unit by making use of premium quality components under the guidance of adroit professionals. It is made in accordance with the set industrial standards is highly reliable. Moreover, customers can avail this from us at a nominal price.